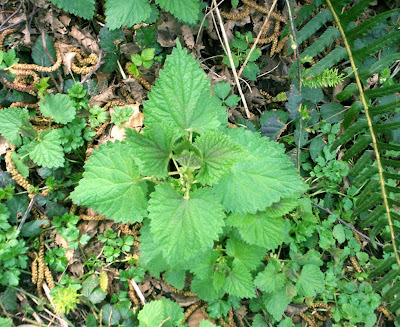 > Roots & Flowers: Nettles ~ Put Some Sting In Your Spring! 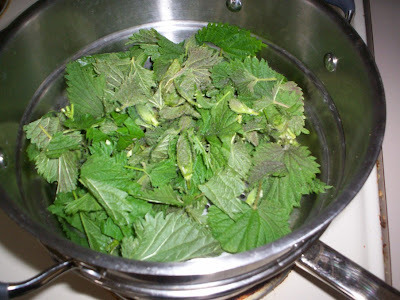 Nettles ~ Put Some Sting In Your Spring! Today my daughter and I harvested our first batch of nettles of the spring! It was so exciting for me because I crave them all year. I harvest the tender tops from the time they first appear in spring through mid-summer when they begin to set flowers. I use gloves and scissors and snip of the new tops into a paper bag. What Do I Do With Stinging Nettles? I enjoy fresh nettle infusions during the spring. The taste is decidely different than from dried nettle. I love it! I steam them and eat then drizzle with chopped garlic, olive oil and apple cider vinegar. SWOON!!!! I dry some for storing so I have nettle infusions all year long. Stinging Nettles are a rich source of calcium, magnesium, zinc, iron, cobalt, copper, potassium, trace minerals, chlorophyll, the B-complex vitamins, and more. Because of their dense concentration of minerals and amino acids, Nettles help to build healthy bones, hair, skin, and teeth, as well as being an excellent tonic for pregnant, lactating, and menopausal women. Nettles are a tonic for the kidney, adrenal, and thyroid glands, so they can help increase and stabilize energy levels. Used regularly for several months, they can prevent hay fever and other allergies. If you should get stung while harvesting nettle look for some yellow dock leaves (pictured below)- they always grow near nettle. Simply crush the leaves and rub on the sting. I'd love to hear how you use spring nettles! This is a very interesting topic! I never knew you could use nettles in this way. 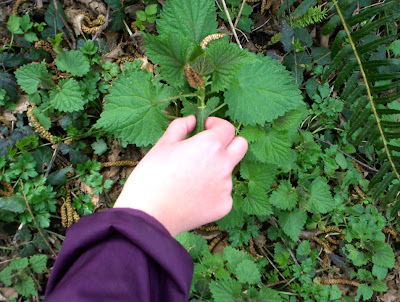 You have a very brave daughter for grabbing the nettles bare handed and eating them! Thank you for giving me a new perception of nettles! Thanks for stopping by Tee. You can eat nettles? Who knew? I learn good stuff here! We have a wild stinging nettle in the pastures, but not same as yours. Ours are really BAD! It's amazing that you eat them/I am amazed!! i am a huge huge fan of nettles . . . i consider them my power plant, my leafy green sister . . . but i've never harvested them wild! i need to check in on google and see when/ if they grow wild down here on the carolina coast . . . thank you! 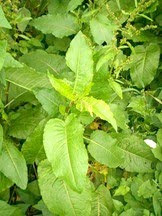 If you should get stung while harvesting nettle look for some yellow dock leaves (I added a picture above)they always grow near nettle. Simply crush the leaves by rubbing together in your hands til juicy and rub on the sting. Some people intentionally apply nettle to arthritic joints claiming it helps mobility, but I've not seen any studies on this.